Does it ever get boring to go to a Mascletà. My answer is "No!" It’s always different and every single time the noise surprises me. Today’s was probably my favorite so far. But they say that they get better each day of Las Fallas. I’m a valencian who lives in Barcelona due to my work. Here, I miss the valencian way of life, the weather, the Barrio del Carmen, and that special light (when the sun goes down) that you comment on one of your pictures. One of these years I hope returning to live there. Last saturday I was in Valencia and I went to the mascleta. 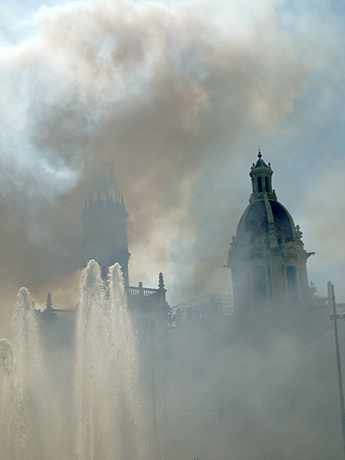 It was really amazing!, despite of being the first of the Fallas. Do not miss the last 4 or 5 mascletas (the bests of Fallas), and the Napolitan Mascleta at Malvarrosa’s Beach (March 15th). thank you for checking out our site and for your comment. We need more of you readers ;). Talking of that special light – I think I managed to make a video of it from our roof and captured the fire of Valencia. At least that’s what it looked like. I think we will go to every single Mascletà …. so we won’t even miss one. At what time is the Napolitan Mascletà? Will it be at 2 pm as well? Your English is perfect – you should hear me speak Spanish — it would be almost just silence, lol! If you have more tips and or places to check out (Bars, Restaurants or Shops) feel free to share them with us in the forums – we will check it out and if we like it – it will be on the blog. Also, would you be interested in exchanging links? Sorry for the delay in my answer. I had a mistake in my comment: Napolitan Mascletá was on March 8th @ 18:00 hrs and not the 15th. But that day, because of the ETA assassination I think it was cancelled. Sure that I will post in the forum some bars, shops and places I like to go when I’m in Valencia. Thank you for reading Hola Valencia.